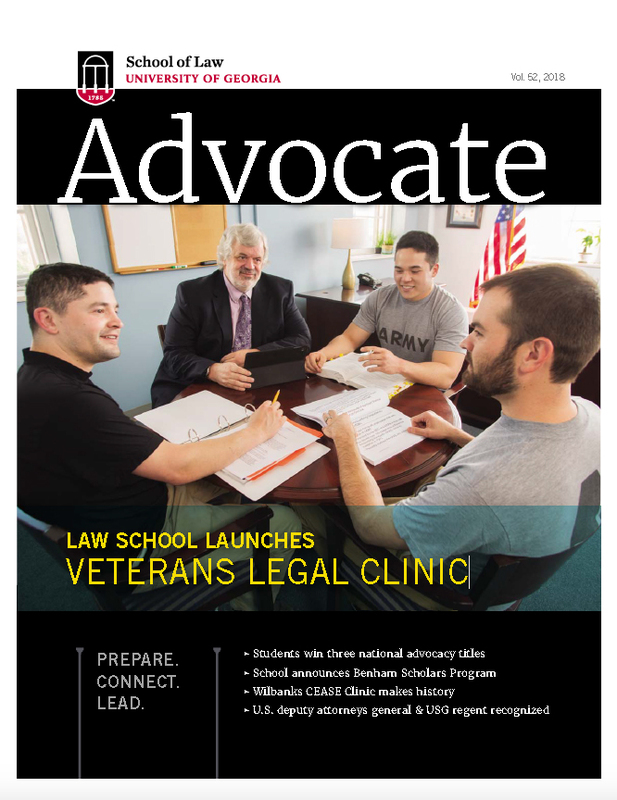 The Advocate is published annually by the University of Georgia School of Law for alumni, friends and members of the law school community. All online issues are in PDF format and require a PDF reader such as Adobe Reader to view or print. To aid in referencing articles in past issues, please utilize the Advocate Online Index. To view past issues of the magazine, please see our Archive Page. School of Law advocacy teams continue to build on the school’s tradition of excellence. During the 2017–18 academic year, law students captured three national championships and one state crown. The Veterans Legal Clinic has opened its doors to provide former service men and women in Georgia with legal assistance they might not otherwise have access to or be able to afford. Major funding was provided by Jim Butler (J.D.’77) in memory of his U.S. Navy fighter pilot father. Named in honor of Georgia Supreme Court Justice Robert Benham, who was a UGA School of Law first-year law student 50 years ago and became the law school’s second African-American graduate in 1970, the law school has created the Benham Scholars Program, which seeks to enhance diversity in the legal profession and to recruit students from underserved parts of the state. investment in the nation for a legal education, the School of Law is committed to preparing the next generation of legal leaders. This page provides a few key indicators of success. This summer 48 students worked in public interest settings around the globe with the assistance of more than $83,000 in grants. This total more than doubles the number of participants from two years ago. A photo essay of this special day. In May, the Wilbanks Child Endangerment and Sexual Exploitation Clinic won the first case tried to verdict under Georgia’s Hidden Predator Act. Associate Professor Melissa J. Durkee and Assistant Professor Lindsey Simon join the law school’s faculty this fall. Durkee will teach in the areas of international, transnational and business law, while Simon will lead courses in bankruptcy and secured transactions. The Dean Rusk International Law Center expands its influence on international law and policy education, scholarship and collaboration as it reaches the four-decade mark.